There is nothing I hate more than having to look for things. So, I have learned over the years that having systems in place really helps to be more on top of things. Whether it be a laundry system or a full-blown money-saving system for buying groceries, there is no doubt in my mind. One of those areas that help to have a system in place is with receipts. Being able to locate proof of a purchase at any time throughout the current year is a money saving time saver. I cannot tell you how many times I lost money all because an item I was returning had since gone on sale. Without a receipt in hand to prove the amount I paid at the time of purchase I was, well, out of luck and forced to settle for the sale price. I HATE to lose money. It is my ultimate frustration. I do know some stores keep track of receipts (who knew) in their computer system. This shocked the heck out of me! However, there are still more stores (quite a few actually) that require a receipt in order to get a full refund. I tried different ways to organize my receipts, but nothing really worked for me. I needed a system that was easy, simple and most importantly worked. At the time I had a blue wooden box that I tossed my receipts in. Yep, that was my uber awesome receipt system! This system, if you could call it that, was messy and unorganized. It took forever to find what I needed since I had to dig through the pile each time. You can only imagine what a chore this was by the end of the year! One day I found this little accordion plastic envelope in my attic. I knew right away that this would work perfectly for organizing our household receipts. It had 12 pockets, one for each month and it was small enough to fit perfectly in my wooden receipt box. 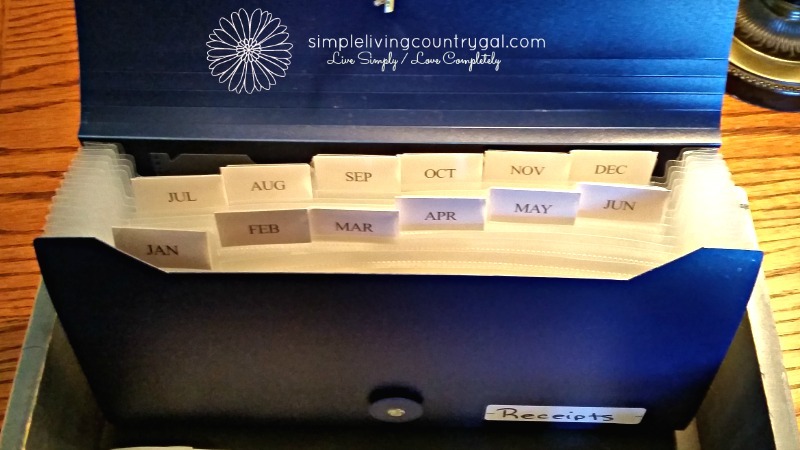 Instantly I had a system in place for organizing and housing all of our household receipts for the entire year. Get a receipt catch-all basket. Any size will do. But I have found a little bigger than what I have pictured here is better. Choose a location that will visually remind you to put any and all receipts there. Whether you choose a kitchen counter or right inside your entryway. The point it to keep it easy to use so you use it consistently. Once a month go through your receipts and discard any unnecessary ones. If you use credit/debit cards, you will want to check receipts against your statement to ensure no errors were made. Once checked you can either staple these receipts to your statement or discard unless they are needed for tax time. 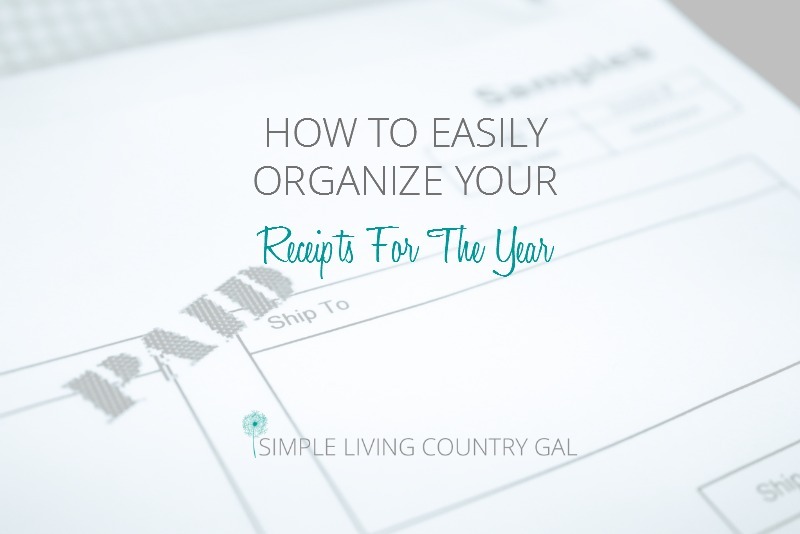 This will really help you to organize your receipts. 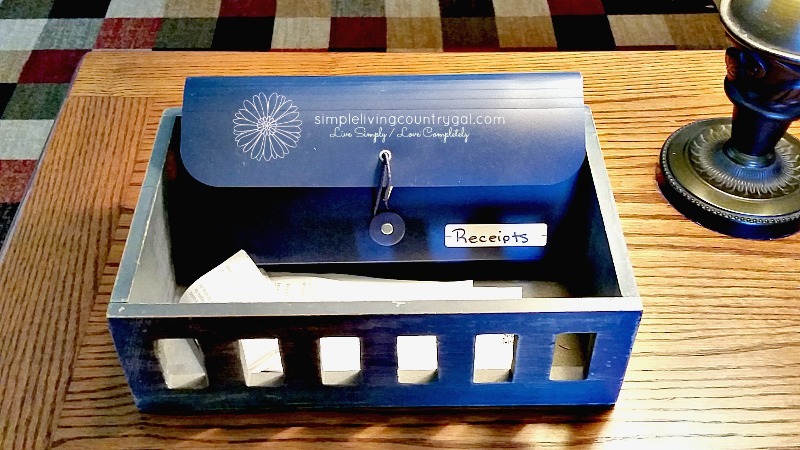 File the remaining receipts in an accordion file such as this one or in another system that works for you. Reference dates on each receipt to ensure you are filing it in the correct month. At the end of the year bundle up your receipts by month then place into a labeled envelope. This way you will have all your information ready to go at tax time. Just 5 steps and done, oh how I love simple. I have been doing our household receipts this way for over 7 years now and it is working perfectly. I know exactly where our reciepts are and finding what I need just requires me remembering the month I bought it in. Setting up systems really does save time and money. As you can see, your systems do not need to be complex and elaborate. Sometimes easy is best. If a system requires too many steps to complete, it is no longer a system…it is a chore. Don’t over think it, keep it simple to ensure you do it! Great advice. I have several side businesses and have been dreading the thought of organizing all the receipts at the end of the year. Right now each one has a labeled photo box and I just chuck the receipts in there, so it’s a huge mess. I am going to have to swing by the dollar store for some of those little file envelopes. Thank you for sharing this, it will save me a huge headache! I am so happy this will help you out! I had looked for a system for years and everything I tried was just too many steps. This is simple, easy and to the point. Been doing this system for years. It really does work. Unfortunately this is too much work for some people. Thanks for the Great advice. I will definitely follow this. My wallet always floods with lots of receipts at the end of the month. I am little lazy in doing my bills and receipt task. But thinking of tying your way to sort out this problem. Thanks. Yes, when it comes to financial papers I am very lazy too. 🙂 I have found if I keep it simple it is much easier for me to keep up with it.